Yep. That’s what they were called. This was the first event specific stab a time trial bike. Starting around the mid 80’s through the 90’s this was how it was done. He does / did .. The Interesting thing was the change that these two images represent. The stock funny bike is what Laruent Fignon is on in the second picture. I think the bars were called ‘cow horns’. 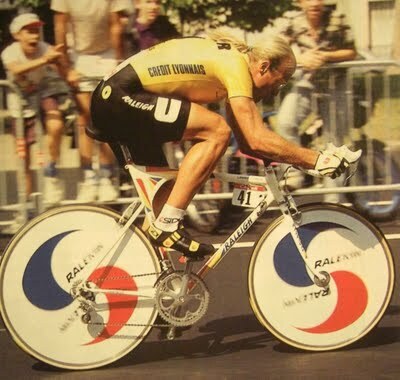 Lemond had the same, but added the center bars from Scott -. Remember this? It’s the final stage of the 1989 Tour de France. After 21 stages and 3285KM of racing Greg LeMond is behind the first placed Laurent Fignon by 50 seconds. An american battling a Frenchman on the last day in Paris. Normally, the final stage is a crit but this was an experiment – a first. An individual time trial – man against clock on the final day. On that day, on that race LeMond rode hard and took back 58 seconds on Fingon to win the stage and the Tour by EIGHT SECONDS. Had LeMond not adopted the unique stance the center bars provided it would have been a frenchman who won that years edition of the greatest stage race in the world. Between the two shots – Greg and Laurent, you see cycling change forever. The funny bike endured for a few more years, but no more on just the cow horns – riders in the race of truth were now for ever after destined to be tucked in, narrow and skinny against the wind. So I now own a Funny Bike. Not just any funny bike. An Eddy Merckx funny bike. And not just any Eddy Merckx funny bike but an MX-Leader edition. Wow. More than that – I own a bit of history. And once I have it built up, I will ride it. Just like the rest of my collection. I am not likely to log four thousand miles on it like I did my corsa-extra this year – but I am looking forward to entering a few of the TT’s next season with it. And roll up to the line under the eye of people who have no idea what they are looking at, next to guys on twelve thousand dollar Cervello’s who take them selves WAY too seriously. That will be fun.